The Beat It jacket is the same jacket that Michael Jackson wore in his famous "Beat It" MTV. This model uses silver mesh as the shoulder part. 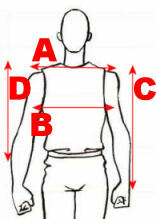 The sleeves can zip off to form a vest and can easily put it back. Beat It Jacket is a must for all MJ fans and impersonators around the world!